Although, living in Scotland, I no longer celebrate the 4th of July as such – it’s often a work day – it is fun to mark it with some kind of barbecue. If the weather plays ball that is. And so far so good on that score, if you don’t mind it a shade on the cool and breezy side. I know the 4th of July isn’t *just* about barbecues. There’s the whole ‘we are free from the Brits’ thing as well. Not really something that I can celebrate too enthusiastically under the circumstances. But barbecueing I CAN do. But for the small matter of being on a plane to London I would be making this, as well as perhaps my grilled miso-butter corn and tofu and this slaw. There are loads and loads of great vegetarian and vegan barbeque ideas on the Internet, so I may be shouting in the wind a bit here, but I do think this one is quite good. I worked really hard on the marinade, tweaking and testing until I have it the way I want it: fragrant, complex, with a background smokiness from the unorthodox addition of chipotle chili. And crucially, I have it so that you will hopefully want to try it too. And did I mention that it is very quick and easy? The heat in the marinade is completely adjustable. In fact, for Miss R’s exam-delayed birthday bash I did the marinade with no chilli whatsoever. This was probably not technically a jerk though, as jerks seem to require a modicum of fire, and that’s putting it mildly (ha ha). But it did have the other two must-haves: allspice and thyme. For the party I made up these paneer and vegetable kebabs, as well as marinating boned chicken thigh pieces and baking them for half an hour at 180C. There was thankfully not a scrap of either leftover so I took that as a thumbs-up. But poor Miss R likes her food spicy so this was undoubtedly a great sacrifice for her (she probs doused hers in hot sauce when no one was looking). And there was only a scoop of leftover mac and cheese, which I did with a simple cheese sauce enhanced with nutmeg, Dijon mustard and turmeric. It is the forlorn and quite refrigerated lump you see on the plate! I hadn’t realised how rubbish that looked at the time of photographing… Anyway, I had enquired if I could put in a layer of cooked kale, but I was rightly rebuffed. Sometimes I am a bit *too* enthusiastic about the old plant foods. A daughter’s 17th is not the time to inflict kale on the unsuspecting. But I did inflict a bit of Mom-dancing before being escorted off the premises by a wiser and less embarrassing Mr A. She would’ve probably rather had the kale. Have you ever embarrassed your children? Was it accidental, or a teeny bit on purpose? Do confess. I can’t be the only making some awful 80s shapes on the dance floor. Adjust this marinade to your liking – more heat (! ), less, or no heat. This recipe make enough for two recipes of paneer and vegetable kebabs, or use the whole recipe for a half kilo (1 lb) of diced chicken thighs. It freezes beautifully and defrosts quickly, so no excuses for using shop-bought marinade. *please use rubber gloves if you have them, or be incredibly careful. Pop all into a blender or food processor or blender (I use my fab Optimum 9400 Froothie power blender so there are no “bits” whatsover) and blend until mostly pureed, with some ‘bits’ still visible. Use within 2 days, storing any leftover marinade in a labelled glass jar for the freezer. *please use firm tofu or even boned chicken thighs if you wish, taking special care to ensure the chicken is thoroughly cooked, and juices run clear. 1. Toss the cubed paneer with the marinade and leave to marinate for at least 1 hour; overnight is fine. 2. Half and hour before you are ready to cook, soak the skewers in water. This prevents them from catching fire when on the grill. Also, go ahead and mix the oil and garlic powder in a small bowl. 3. 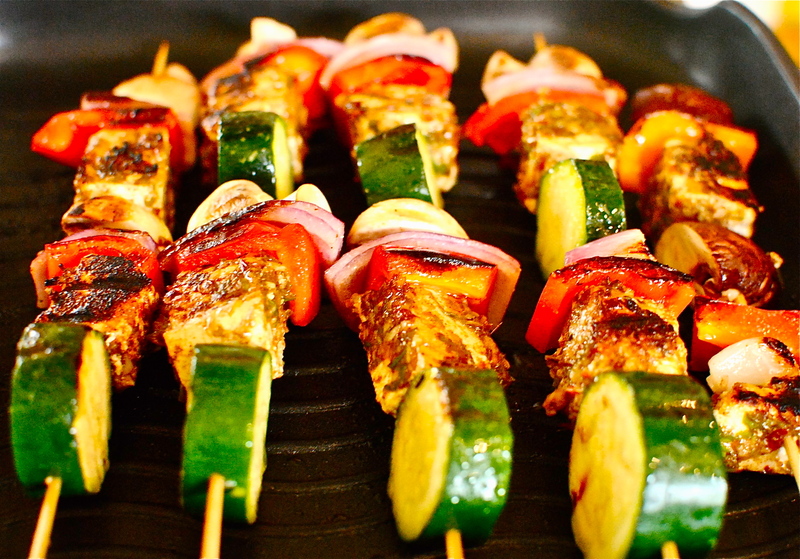 When you are ready to cook, thread the paneer and vegetables onto the skewers, then paint the garlic oil over all. 4. Place over prepared ashy coals, or onto a hot griddle pan. The timing depends on your cooking method and the heat you have, so watch the kebabs. Turn carefully for even grilling, taking care not to scorch. Toss together and serve immediately. This is very refreshing and goes well with all picnic, grilled and barbecued foods as well as in wraps. Add some cooked prawns or raw nuts for a protein-packed salad. I am sending this over to Javelin Warrior’s Cookin’ w/ Luv Made With Love Mondays, as it is most definitely from-scratch and made with love. And it is very easy too. Which means I love it. More time for Mom-dancing! The Spicy RD (great ideas here – and all healthy), Babycenter.com, Food52,Coffee and Giggles (these are sweet treats & drinks), The Kitchn and the blog at Eating Well. If you have a healthy 4th of July post, please let me know and I will add you onto this little list. Make it quick though! !!! I wonder if I could do this with tofu cubes, pressed first, to get all the liquid out, and then jerk marinated. Something tells me it would be pretty awesome summer BBQ. Of course, I have to fight the other pork-rib-and-chicken-thigh-toting apartment dwellers for space on the pool grill. Guess I’ll have to wow them with my bikini so they’ll move over for my veggies. HA! Cheers, Kellie. And Happy 4th, no matter where you spend it. It’s a good day for all of us to remember where we came from and the principles on which this country was founded (and in some ways has gotten away from). 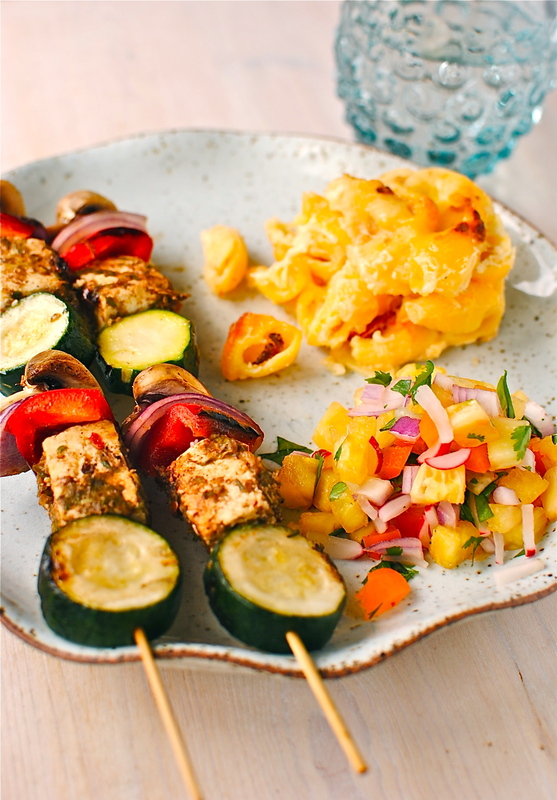 We tend to grill plainly and then serve with salsa (veggie or fruit) on the side. Then everyone can temper the “sauce” to suit their liking. 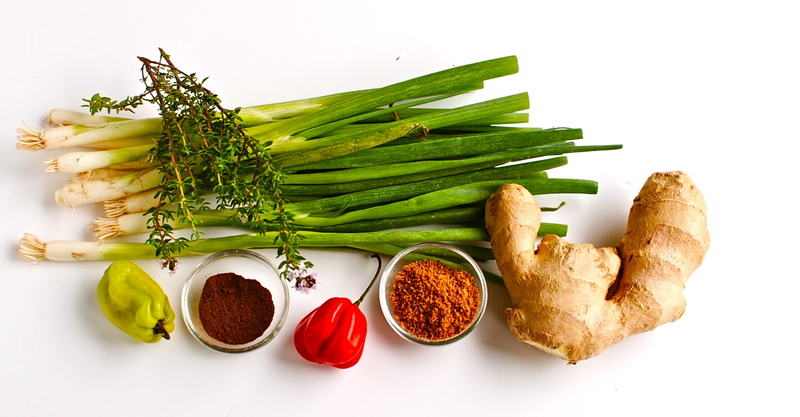 But spicy jerk marinade for veggies sounds so delightful we may just break out of out routine! Happy 4th Kellie! Yum! 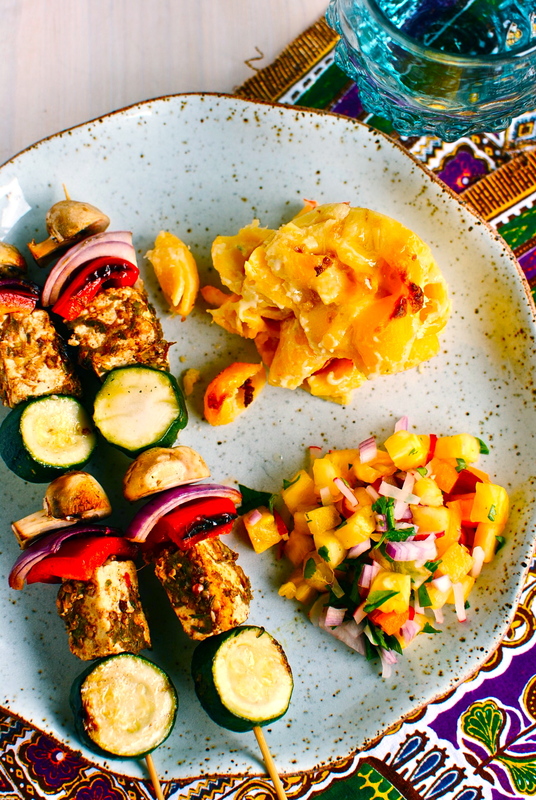 I just love anything paneer, and have grilled it before with great success, so I know these kebabs would be a hit. Good call on the chipotle in the sauce, it’s one of my favourite flavours. An American friend and I are co-hosting a Canada Day / 4th of July bbq this Friday for a group of expats, and I think these would make a great addition to the menu. Happy 4th to you! Yay! Miss R has another couple of goodies up her sleeve. And soon she will be helping produce a local band’s second album (they are a Scottish rock band but with a twist!) so they will no doubt feature before too long. She is quite good at finding bands before anyone else has even the faintest sniff of them. I will tell her you said that! She likes all music, even the crappy stuff (a little), but prefers listening to and going to see off-beat bands. Or at least off-beat compared to the usual taste of 17-year olds. Thank God. Aw thanks. But I understand your obsession with current British music, so you are forgiven ;D I blame Miss R and her exquisite ear for a fab tune. HA! I don’t think you can pin the blame on a Scottish teenager for your roosters! Happy 4th of July when it comes Kellie! 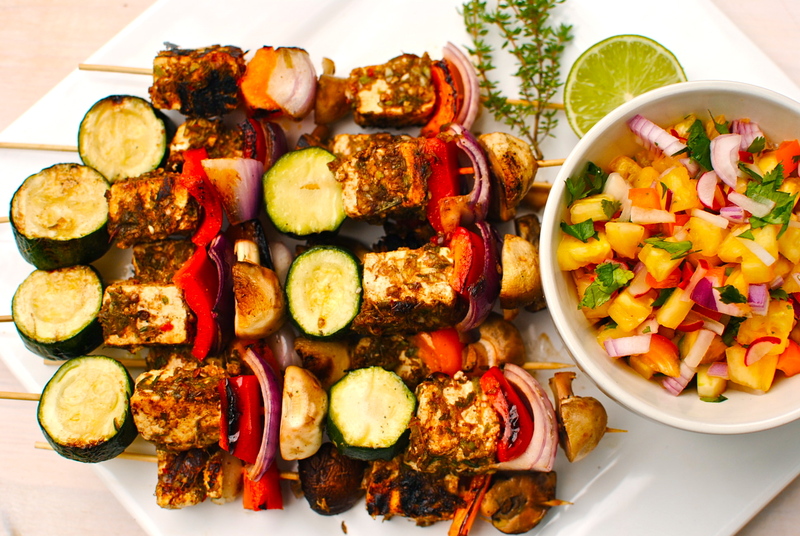 I’m sure these jerk paneer veggie kebabs would be most welcome at the celebratory BBQ’s! Have a blast at FBC this year too. I’m sure it will be lots of fun! Thanks Jacqueline. We will miss you! Ooh Kellie this was delicious! Just finished making this for my tea tonight and the flavours were fantastic. I love spicy food so I did add both types of chillies to the marinade and cos I didn’t have any Worcestershire sauce, I added some tamarind paste instead. My husband is triathlon training and cutting down on calories so this was perfect. I also used a wee bit of haloumi cheese and a few tiger prawns for protein. Well worth the wait for the marinade to infuse. I’ve stashed the rest in the freezer for next week. We are also just back from holiday and this made a summery finish to the day after all this dreich Scottish weather ! Fantastic news! I would hate to have ruined your dinner! It is funny, because I did actually think of tamarind before I reached for the Worcestershire. Spooky 😀 I love your tweaks – it is quite an amenable little rub/marinade. I have used it from the freezer and it is absolutely fine and defrosts very quickly. Tell your husband ‘good luck’ for his triathlon from me. HTe only thing I am training for right now is eating my way around London! lovely recipe Kellie. I have not really cooked with Paneer before. I have some Tofu in the fridge so may give it a go with that. I like the marinade rub and salsa too. This is all such a perfect summer recipe. I had a lovely paneer recipe at a friends house recently – where they had crumbled the paneer and it was cooked with lots of indian spices and coriander and chilli. It was unbelievably tasty! ps looking forward to seeing you this weekend! This looks fab! Always good to see an interesting vegetarian addition to a BBQ… I think in our house these might even go before some of the meat ones! Kellie, I just made this with a few changes. I liked the marinade so much that I basted the vegetables with it too. My cheese didn’t get firm enough to skewer so I gently placed it on a grill plate and grilled it that way. I served it all a bed of greens. It was so enjoyable!!! I will definately make this again! Thanks for your great recipes! Thanks for the feedback, Linda. I’m glad you loved the marinade! I’m wondering though why the paneer wasn’t firm enough. I haven’t had that problem with my recipe but I guess there are a number of individual variables that could account for it. I’m pleased that you were able to lay it directly on the grill plate and enjoy it that way though. I hope you have some marinade in the freezer for another time. It keeps well. There’s a good chance I didn’t let it drain long enough. My first time making it. I’ll try it again – and soon! That’s probably it. And don’t be afraid to give it a bit of a squeeze in the cloth.